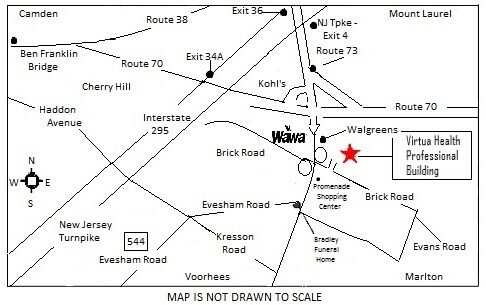 Take Route 73 South to Brick Road, there is a WaWa on corner. Go through this light and make your first right around the jug handle and cross over Route 73. Make you first left into the driveway for the Garden State Community Medical Center parking lot. We are located on the first floor – Suite 103. (** if you pass the hospital you have gone too far). Take the New Jersey Turnpike South to Exit 4. Get on to Route 73 South and follow straight to Marlton. Follow directions above. Take Route 295 South to Exit 36 and get on Route 73 South. Follow straight to Marlton. Follow directions above. Take Route 70 West to route 70/73 intersection. Bear right onto Route 73 South. Follow directions above. Take the Atlantic City Expressway West to Exit 31. Follow Route 73 North for approximately 15 miles and make a right onto Brick Road (just after the Promenade Shopping Center). Make you first left into the driveway for the Garden State Community Medical Center parking lot. We are located on the first floor – Suite 103. (** if you pass the hospital you have gone too far). Take the New Jersey Turnpike to Exit 4. Get onto Route 73 South and follow straight to Marlton. Follow directions above. Take Route 295 North to Exit 34S. Take Route 70 East and follow straight to Route 73 South. Follow directions above. After crossing over the Tacony-Palmyra Bridge, follow Route 73 South straight approximately 11 miles to the Route70/73 overpass. Follow directions above.